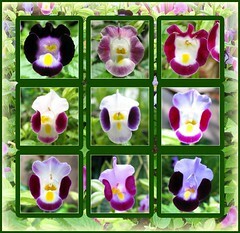 Herein lies the many colorful faces of the Wishbone Flower that happily greet us, endlessly! 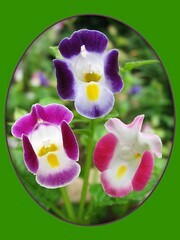 They’re found growing everywhere and anywhere – in hanging pots, containers and flower beds, even on mossy bricks. Every nook and corner in our tropical garden, sharing and squeezing as long as there’s moisture and soil! Such happy faces that just need sunshine and rain, needing no vitamins at all! Amazing and incredible, yet proven true – the insect pollinators must have been busy at work, overtime probably! And these annual flowering plants, also commonly known as Bluewings, are such great producers, self-seeding in abundance too! We just love them! Updated July 23, 2007 – If you’re interested to know how this 9-photo collage was done, follow this link! Updated Sept 4, 2007 – Wow! Another 3 more gorgeous faces were found greeting us in our garden last month, as pictured in this collage of 3 torenia photos blended together!